other information Green Linnet CSIF 3082, 1993. 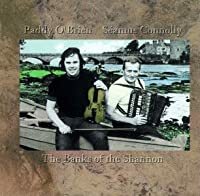 The five tracks of Paddy solo are remasters of 78 rpm records recorded "in early 1954" in Newtown, Tipperary, with Charlie's piano accompaniment added in September 1990. The six trio tracks are copies of the six tracks on the 1973 LP "Banks of the Shannon," recorded in July 1973 in Dublin. Then there are three tracks of the Séamus/Charlie duet, and the one solo by Séamus, all recorded in August 1990.